This article originally appeared on CityWide Stories. The animals couldn’t see or hear her, and they didn’t know she was going to throw them in the river. But that is every freshwater mussel’s proper destiny, and these mussels are the start of a massive effort to bring vital mollusks back to waterways where they’ve almost disappeared — along with the ecosystem they once supported. 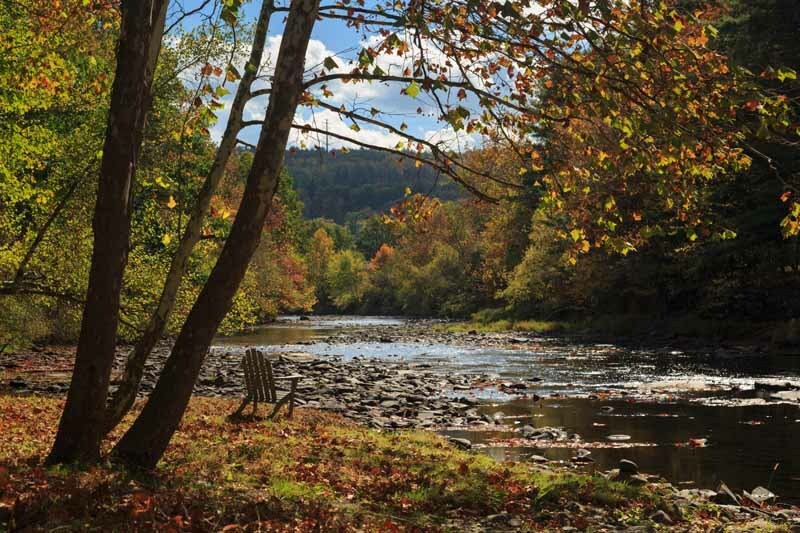 Pennsylvania’s own Delaware Estuary (which Kreeger says is the world’s largest freshwater tidal estuary) is home to a significant new effort in conservation: the proposed Aquatic Research and Restoration Center (ARRC), a partnership among six local institutions. The initiative goes back several years. In 2013, the Philadelphia Water Department, Partnership for the Delaware Estuary (PDE) and Drexel University (including its Academy of Natural Sciences) signed a Memorandum of Understanding (MOU) to establish guidelines for developing ARRC in Philadelphia. On May 1, the project formally received three additional partners: Philadelphia Parks & Recreation, the John Bartram Association (which operates Bartram’s Garden) and the Independence Seaport Museum. ARRC will be a conservation entity with state, federal and corporate partners. Its primary work will be propagating, raising, releasing and monitoring new populations of freshwater mussels and shad (a once-plentiful fish native to the area), and providing new environmental outreach and learning opportunities for students at all levels, from grade-schoolers to post-grads. 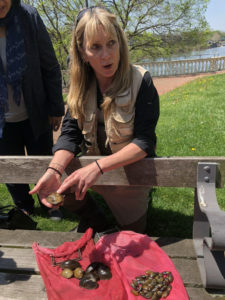 After welcoming the new partners at a ceremony along the Schuylkill, Kreeger and her scientist colleague, Roger Thomas of the Academy of Natural Sciences, donned full-body wading suits and got waist-deep in the cool greenish water with a net of mussels. These new river residents came from the Mussel Hatchery at Fairmount Water Works, which you can see for yourself during open hours at the Fairmount Water Works Interpretive Center. ARRC partners emphasized that this hatchery, which has raised about 30,000 freshwater mussels so far, is primarily an outreach and educational center. But Kreeger said that a second hatchery is in the works that will provide mussels all the way down to the Chesapeake Watershed — up to one million mussels per year. But why should we care about mussels? Out of hundreds of mussel species worldwide, fewer than 20 are edible to us, and freshwater mussels aren’t very tasty to humans, though many of their cousins are favored in cuisines around the globe. Mussels are important because, as Kreeger explained in an ARRC statement, a river without mussels is like your body without kidneys. Nestling together by the thousands in river-bottom “beds,” the mollusks prevent erosion and serve as a powerful filtration system, both for natural substances and chemicals. A single adult mussel can filter up to 20 gallons of water a day. That means that every hectare (an area of about two and a half acres) of healthy mussel beds can filter 10 million gallons of water every day. They literally clear the water, allowing native aquatic plants to flourish in sunlight, instead of choking under algae in dirty, cloudy water. There are more than 700 species of freshwater mussels worldwide, on every continent except Antarctica, and North America boasts almost 300 of them. But because of man-made factors like pollution and dams, 70 percent of North American freshwater mussel species are at risk of extinction, including more than a dozen species in New Jersey, Pennsylvania, and Delaware. If the mussels are in trouble, so is our water, and so are we. Freshwater mussels have a unique life cycle. They hatch as tiny larvae that must attach themselves to the gills or fins of specific fish species. There, they complete a metamorphosis into their bivalve shell bodies (the mussel babies are so small fish don’t even notice them). Then they drop off their fishy hosts to grow in the river bed. Angela Padelleti, science programs manager at PDE, explains more about the hatchery process. When the mom mussels are ready to release their larvae, scientists collect these babies (called glochidia) — they’re no bigger than a grain of sand — and add them to a five-gallon bucket along with those helpful fish, which go back into their large tanks while the mussels metamorphose over a week or two. When the young mussels drop off, they’re collected into special tanks with hourly algae feedings, and then released into nearby waterways, where they can help restore a lost ecosystem. Eventually, Padelleti hopes that ordinary folks can get involved by “babysitting” or “adopting” infant mussels. That’s still a few years away, but Padelleti advises keeping an eye on PDE’s website for updates if you want to contribute to this important river renaissance.